Port Douglas Artists Group Comprises Professional Artists. 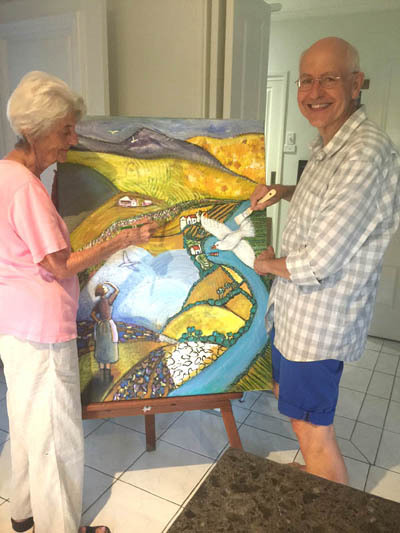 The Port Douglas Artists group has worked together on a number of projects over the last twenty years. All professional and experienced artists, they initially came together when they exhibited at Mowbray Gallery and Port Douglas Gallery of Fine Art, many also being involved with residencies at Radisson Royal Palms Resort and Hi Tide Restaurant. Further involvement in Go Troppo Arts Festival exhibitions at the iconic Sugar Wharf and teaching workshops at various locations, under the umbrella of Arthouse Port Douglas, contributed to the cohesion of this group of independent artists. Later they collaborated to open studios and galleries at the Reef Marina in Port Douglas. When those spaces were closed they organised the 'Windows Project' at the Marina, displaying high quality artworks in the windows of empty shops and meeting regularly with interested members of the public. 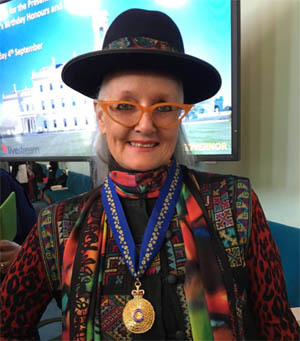 One of our valued members, Linda Jackson has been awarded the Order of Australia medal for her contribution to the Arts and Fashion, the presentation being held at Government House on September 4, 2018. Congratulations, Linda, we are very proud of you! Port Douglas Artists Becomes A Legal Entity! Since those days the group has aimed to engage in at least one group project each year. As part of Port Douglas Village Carnivale in May 2015, artists collaborated with a group of British musicians to develop their newest CD, 'In Paradise'. Here's that story. They then decided to formalise their relationship by becoming an incorporated group and started planning for an exhibition to be held in 2016. Much as they would have loved to hold such an event at their old exhibition space, the iconic Sugar Wharf building in Port Douglas, that has now become so popular for weddings that it is impossible to book as an exhibition venue for more than a couple of days! Their second choice, but an excellent one, was the Tanks Arts Centre in Cairns, a venue that relates extremely well to their chosen subject, situated as it is in the Cairns Botanic Gardens. And so, 'Gondwana's Garden' started to evolve. Twenty established artists from the Port Douglas/Cairns/Tablelands area of North Queensland, including Port Douglas Artists members, were invited to be part of the exhibition and, after months of preparation the project was launched. Artists were chosen, initially, because of their involvement with this website, because of their professionalism and because the organisers felt that their work would lend interest and balance to the whole. There were painters, printmakers and sculptors, working in a variety of mediums such as paint, ink, glass, fibre and clay. New, highly skilled, members joined the group so we're growing in the best way possible! We loved it if you were able to come but understand that, if you are reading this in Ireland, Iceland, Iran, Indonesia, Israel, Italy or any of the other hundreds of countries starting with other letters of the alphabet, you may not have been able to hop on a plane and visit. So an online exhibition may be viewed on this website - HERE it is! 'Gondwana's Garden' ran from May 27 - June 16, 2016. Please check details of the Tanks Arts programme here. The exhibition was also intended as a fundraiser for the soon-to-be-built Mossman Botanic Gardens. They do say that, if you want something done, to ask a busy person (or people in this case). In addition to their involvement in organising 'Gondwana's Garden', Port Douglas Artists Inc was part of the inaugural Container Art project in the park between Saint Mary's Church and the Combined Club, 19 - 21 May, 2016. Carnivale, each year, continues to be quite spectacular, so don't miss out! Then, in 2018, Port Douglas Artists organised the first exhibition for years to be held in the old Sugar Wharf, over three days of Carnivale (25 - 27 May). 'Tropical Colour' showcased varied artwork, gifts and demonstrations. Did you visit us? If so, you were probably one of those who loved the work and especially loved the venue! At the conclusion of the Tanks exhibition, a selection of the Gondwana Gardens artwork was displayed over several weeks in the Douglas Shire Council foyer, thus giving more residents and visitors the opportunity to see it. A Closing ceremony was held there, when the raffle draw for winners of the four, large collaborative paintings was held, thus bringing this highly successful project to a conclusion. President Terry Johnson, has the last word. 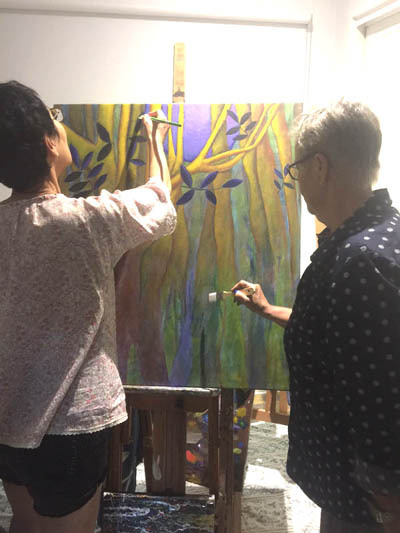 Yoshiko and Joy work on their collaborative painting. Jill and Terry put finishing touches to a group collaboration. Ah! Not quite! In 2017 a highly successful Calendars 2018 project was held. This served as a fundraiser for the group as well as promotion for individual, participating artists. Thanks to members of the public who invested in this inexpensive, top quality memento. Funds raised will be used towards future community art projects. So what is this small group planning in 2019? Yes, this group of professional artists only numbers a score of members, if that. But they have access to highly competent artists of the region, so can invite them to participate in exhibitions or workshops, as well as calling on their skills to help develop concepts to the point of presentation or interaction with the public. In 2018 the interest in holding an ephemeral sculpture event grew, following very successful workshops aimed at preparing participants for involvement in the actual building of sculptures at various locations in the Douglas Shire in September 2019. Watch this space for updates about that - or fill in the form, below.